150 years ago in fact the Fathers of Confederation met in Prince Edward Island and the Federal Dominion of Canada was formed. 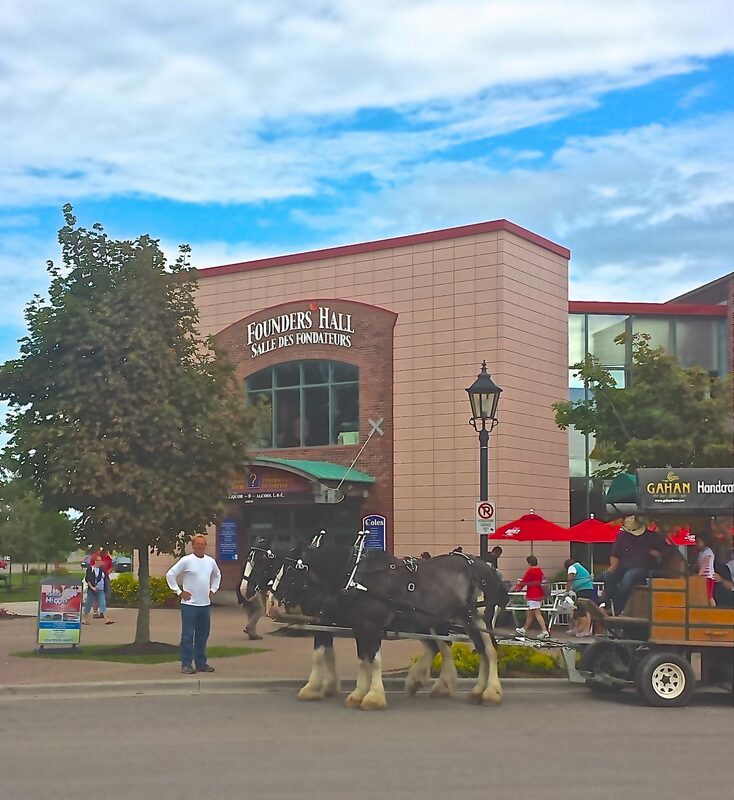 Today actors in vintage apparel weave the yarn of history in the marine village of Charlottetown while Golf PEI is making new history. 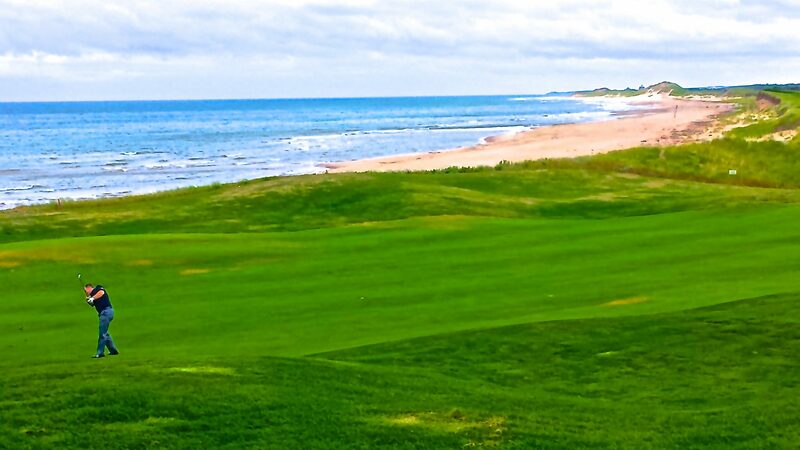 Around 30 fabulous courses between farmlands and beaches are within half an hour of one another. The island lifestyle is laid-back, but the culinary experience is simply exquisite with the freshest ingredients from the surf and turf. Begin at Brudenell River, not just parkland style, but part of the park system, formerly a campground. Three 3s, Three 4s and Three 5s on each nine were inspired perhaps by the 3 rivers that converge along the course. Hear the waves of Brudenell splashing and wind howling through the trees. Hole 17 is named “Panorama” and it truly is, leading to “The Orchard” for a sweet finishing hole. 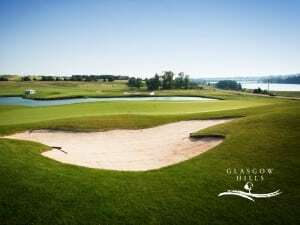 The practice area and clubhouse are shared with the Dundarave course designed by Dr. Michael Hurdzan and Dana Fry where French Canadian PGA pro, Anne Chouinard presides. She coached LPGA player, Lorie Kane for 10 years and started an academy here then moved it to Fox Meadows but came back to Dundarave teaching lots of students on site. 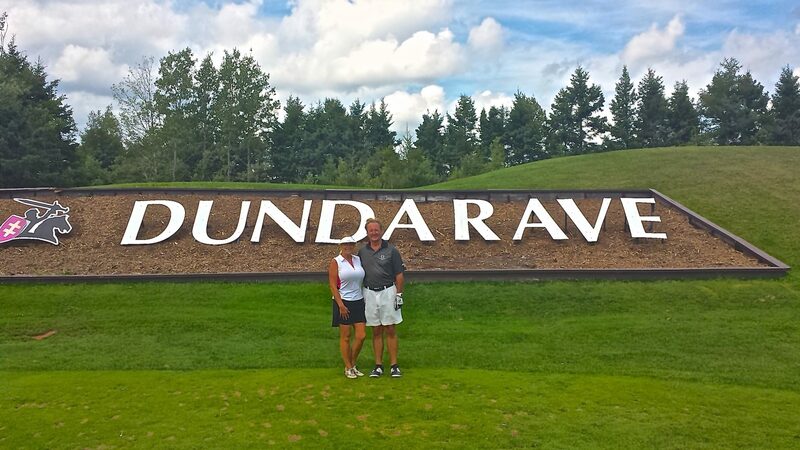 Lorie also returns to Dundarave for the friendship and the tour like speed and condition of the greens. The engaging starter Dave, paired us up on Dundarave with member Barry White, a 73 year old who boldly initiated a beer bet on the first tee box. He turns out to be the dad and former caddy of Nancy White on the LPGA tour. She now owns the Mulligans Golf Center, in Virginia, a previous customer of ours. Barry has meanwhile made a name for himself on Dundarave and shared his local knowledge while giving Danny a run for his money though shy of a win, which shocked the course employees. Jokes, LPGA stories and smack talk bantered for a fun 18 after which Alice bought the beer. A flavorful ritual with any beverage at the 19th in PEI is to devour steamed mussels, fresh from the sea. Sea glass and pottery chards turn up on the beach with sand dollars and shells for collectors. Life’s a beach in PEI – in attitude, latitude, views, and lifestyle. Never more than 30 minutes away, the beaches are a very merry part of the Maritimes.The ocean has many outlets for the most authentic seafood harvest – clam or oyster digging; kayaking, swimming, boating or just strolling the vast sandy strands. Sports extremists can take a kite board lesson like Kerry. 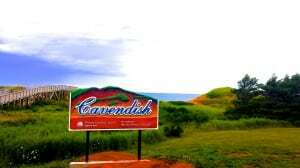 Families, singles, couples or buddies might opt for Cavendish Beach with boardwalk trails for hikes or bikes, a canteen, music, events and the Marco Polo campgrounds next to Avonlea. Set in the 1900s in Avonlea, this story of a braided red head is still required reading by Japanese who fall in love with the dramatic dreamer. Busloads are dropped off next to a tee box on the Green Gables Golf course. Sometimes the tourists wander down the fairway accidentally. The course layout can seem as precocious and diverse as Anne’s personality. Running through the Green Gables farm where the Nova Scotia orphan found her home, there is a back view of Anne’s house on hole #11. The story was translated into the longest running musical – a must see whether a fan or unfamiliar with the coming of age story. You might come out singing “Ice Cream” from the scene where she first tasted it at the Sunday picnic. If so, the island has Cow’s creamery, conveniently serving in most spots with a factory tour en route to the Confederate Bridge. 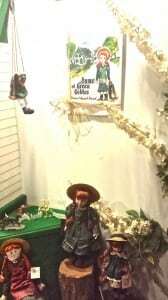 The simplicity personified by Anne of Green Gables permeates Prince Edward Island, reflected in the people and culture. There is a refreshing air of contentment, fun and humor in a modern way. Cell signal and Wi-Fi supersede capabilities in the states. When departing our cashier said, “Oh you have to see Anne and Gilbert next (the musical sequel). I’ve seen it 3 times this summer. They get married!” Gee, it’s almost like visiting a seaside Pleasantville but in full color and with spirits served. Glasgow Hills are alive with the sound of birds and on our round, raindrops but the patchwork quilt view was unspoiled from the perched hilltop tee boxes in North Rustico. Number nine is a most memorable peninsula green returning to the clubhouse. 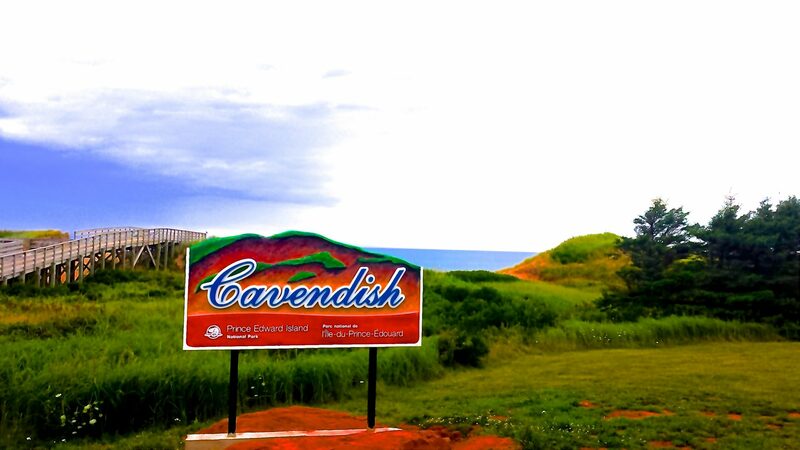 120 couples flock to the Cavendish Beach Couples Event hosted here with 2 other courses, successfully running for 9 years. It is mainly a social event with a few competitive highlights on course. 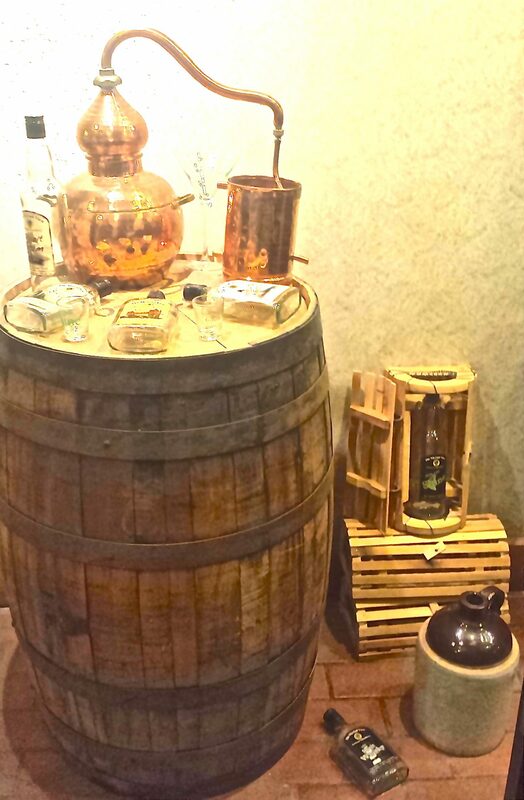 lightning at Myriad distillery. 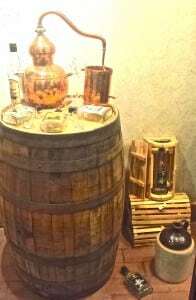 This is legal moonshine. Potatoes being the main island crop, a halved and hollowed spud serves as a shot glass after the fields of purple flowers yield the spirited vessels. Cooked any which way, they take the potato cake. You take heed on the myriad servings or you might end up with a crazy story. The Delta hotel and conference center on the Water’s Edge, for which their restaurant is aptly named, is a perfect place to stay. 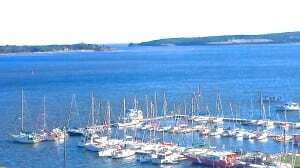 Spacious rooms have a comfy window seat view of the harbor full of yachts, sails, and activities. It has a superior bed, pulsating shower with robe and free Wi-Fi that works. Restaurants, shops and entertainment are all in walking distance of the Delta and golf courses are a 30-minute drive. Step out to stroll the marina from sunrise past sunset for people watching, dining, shopping and boat tours. Take a Top Notch Lobster Tour in the bay aboard a covered fishing boat for fish and lobster lore. All in the family, 5 siblings plus parents still fish commercially, sharing info on a secret channel before during and after a run at sea. They invent new rigging for one-way cage cafeterias so the lobsters can’t dash and dine out of the trap. They have the best fish stories. One day Top Notch owner Mark and his Dad had 2 Blue Fin on the line of the strapped reels. A choice must be made, to cut one, (but which had more promise?) or try to land both and probably lose each as they would tangle their lines fighting for many hours against the take. Since they knew Uncle Bobby was nearby, they kept one line and let the other go with a buoy attached so that he could find it. Captain Mark too excitedly made the radio announcement not realizing it was the public channel and all the boats streamed in for the pot of gold. A single tuna’s ticket to Tokyo can yield over $12k! Good news, Uncle Bobby arrived first; bad news, no tuna was fighting. Later though the shouting began as the line went taught and the fight ensued, landing both tunas for a very lucrative day. Tuna charters are available for up to 4 people for $1150 a day not including of course the pricey tuna. James Cameron the Avatar producer purchased his for mounting. 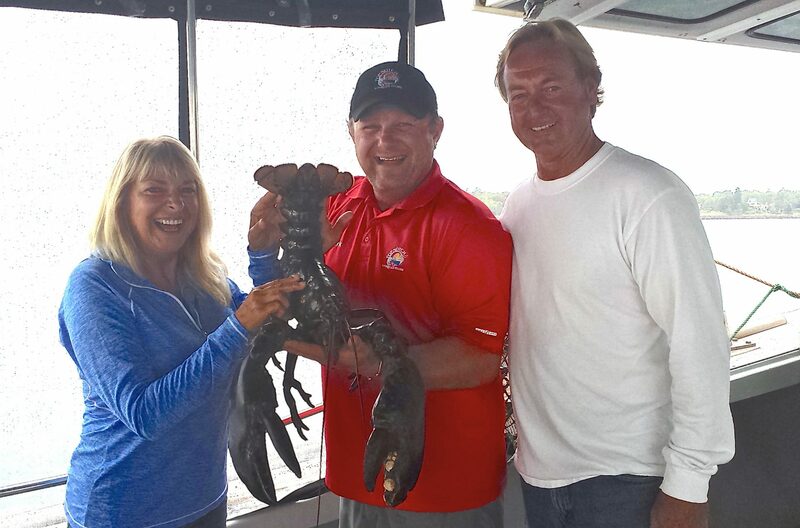 The Lobster Tours do include a scrumptious lobster dinner and are affordable for all. Very entertaining and educational, you are bound to say, “ Wow I never knew that.” We met Larry the lobster, age 44 and 12 pounds, summer vacationing in Mark’s ocean floor condo. He served as a demonstration for the wonder of lobsters. They can regenerate limbs, eyes and other essential organs. Forget space exploration; why not study this regenerative phenomenon? Sim’s Corner Steakhouse and Oyster Bar is simply the best of the best. While there are many great restaurants on the island, Sim’s Chef Kyle was a star on the Kitchen Uncovered show. Order his peppered steak and gastrique and you will want to try it at home. Easy enough, he demonstrates the technique during the show, seen here: http://m.youtube.com/watch?v=trqyk39xgoA&sns=em Guests will definitely be impressed if you pull off this meal! 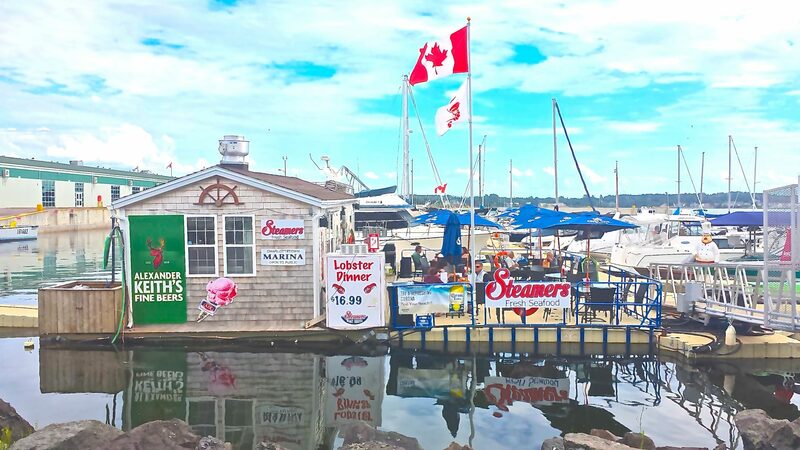 Chef Kyle says, “Sim’s has pumped up the atmosphere.” With its décor, piano bar and corner al fresco seating a couple blocks from the Delta in Charlottetown, Sim’s is the place to see and be seen. 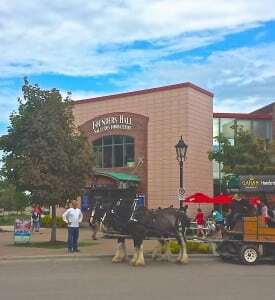 He has traveled abroad and fine tuned his culinary skills but had to return to his Prince Edward Island because as he says, “ I missed the locals. We have a different pace. We don’t pick up the trends.” He started One Vision Farms, and puts the culture in agriculture. Winner of the PEI Local Seafood Champion award in ‘12 and the Burger Champion, he notes that, “Canada’s known for Alberta beef but those roaming the hills of PEI are every bit as good.” Yes, they look good on the hillsides and taste good too. You can get everything you want food wise in PEI and it is fresh. Lot 30 is another great cuisine pick, also downtown, with a unique new menu every day based on local fresh availability. Don’t ask for the special or whatever you liked last time. It’s a new adventure with special features every meal. Reservations are recommended wherever you dine in the evening. This island is different. 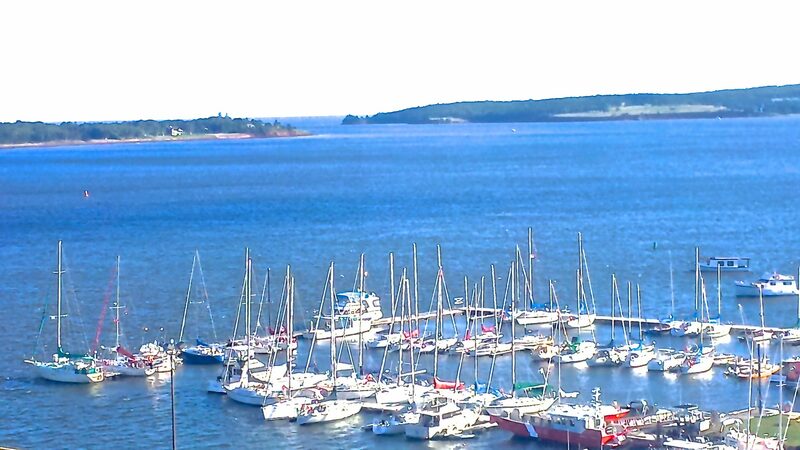 It’s situated above Maine and Nova Scotia, yet has the warmest waters north of the Carolinas. The golf is high quality with a value price tag. Pay in American, same as Canadian. Or exchange more favorably at a bank for pretty pastel paper bills, and looney and tooney coins. 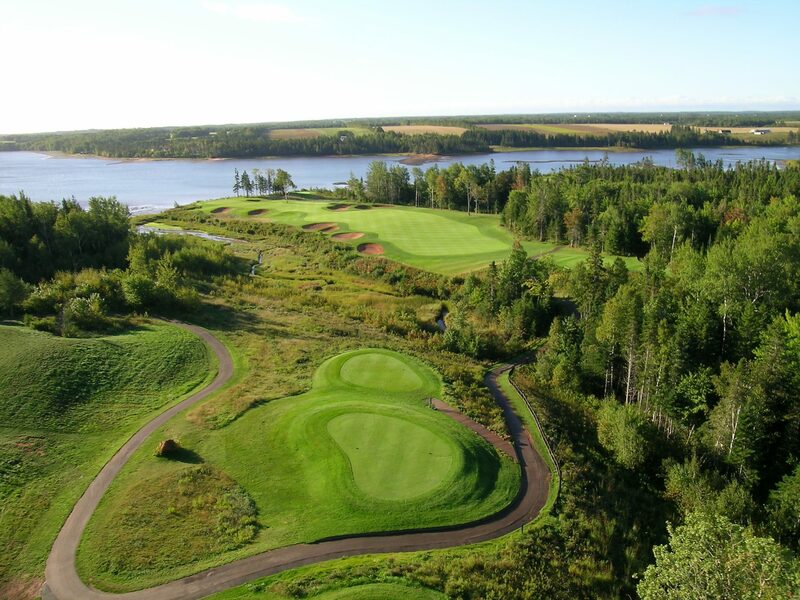 Use them to pay for an unforgettable round at Crowbush Cove. Number 16 is the signature hole of the island sprawling along the ocean. The carry from the back tees is long, especially against the normally prevailing wind. 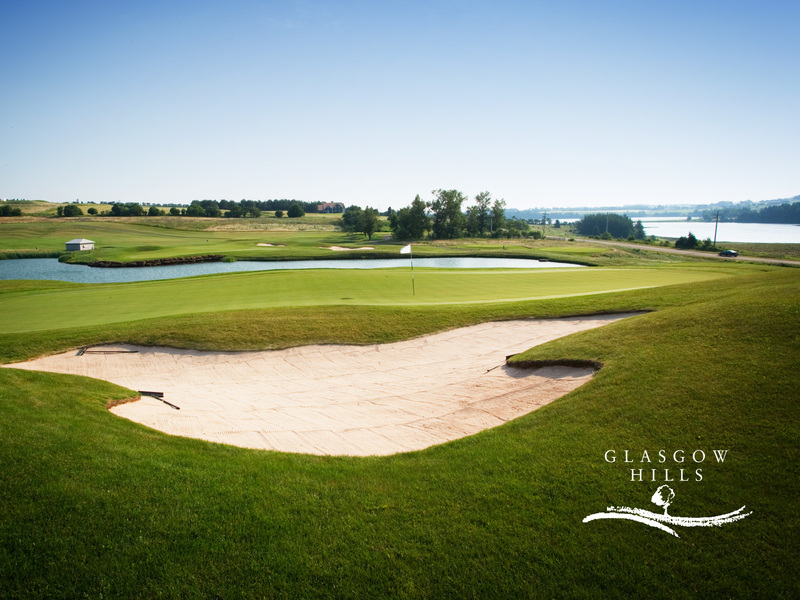 Look back and ahhh from the green, then scramble up the steps by the 17 tee box to the crow’s nest for a 360 degree bird’s eye view and ahh again. On 14, a real osprey nest with a gallery of 3 was peering down. 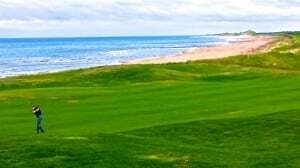 Between holes on the course is a trail to the beach of Crowbush Cove for rest after the round. Make it a long and pretty road trip north; over the lengthy confederate bridge which when approved by a narrow 52/48 vote, tourism skyrocketed. Or fly into PEI direct from JFK or into Halifax, Nova Scotia for an added bonus but that’s another story. One that includes seeing a whale breach on the ferry ride to PEI. Make your own vacation story. Check out www.golfpei.com. Mark McLane, Executive Director of Golf PEI has a stellar staff ready to assist. Go this month or plan for next year. 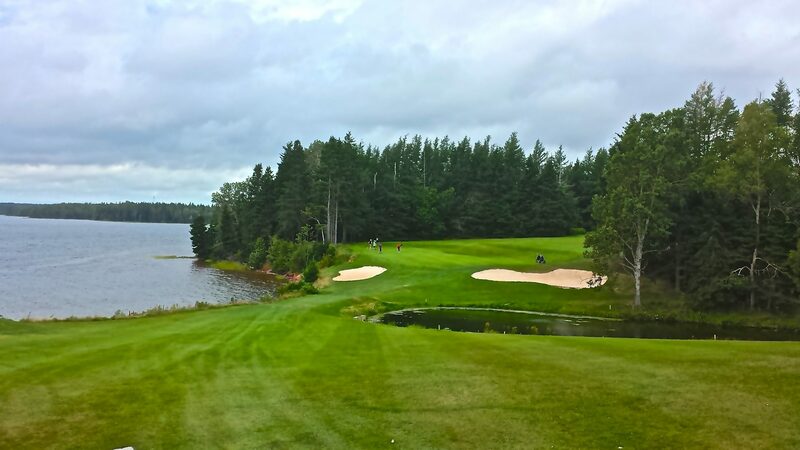 But go – for the love of golf, seafood, spuds and a brewery for suds.